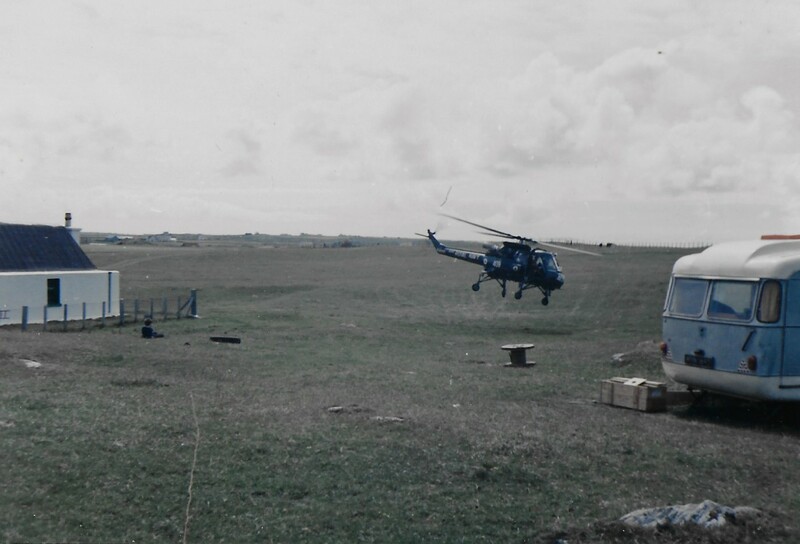 Colour photograph of a Navy ‘Wasp’ helicopter taking off from the Decca HIFIX caravan at Aird, Cornaigmore, in 1970. 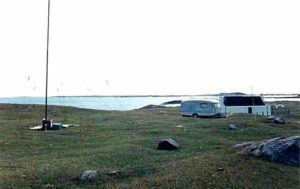 HIFIX stations were located at several spots in the Hebrides for relaying messages to/from survey vessels at sea, which were recording the topography of the ocean floor. The Navy had sent personnel ashore by helicopter to lay a cable from the mains electricity suppy to the caravan, in response to a complaint by the occupier of the house, Mr A Campbell, about the noise made by the caravan’s generator. 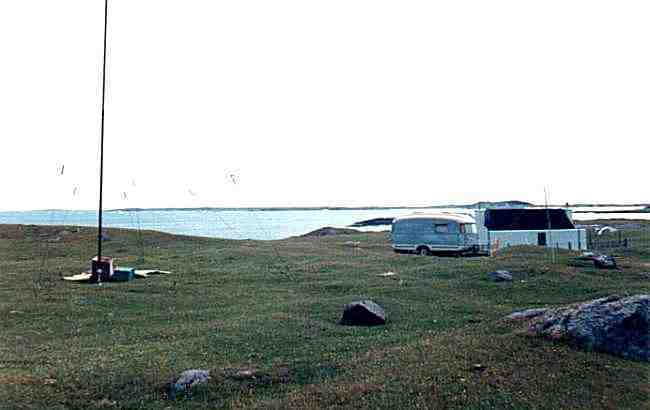 Colour photograph of the Decca HIFIX mast and caravan next to the house at Aird, Cornaigmore, in 1970. HIFIX stations were located at several spots in the Hebrides for relaying messages to/from survey vessels at sea, which were recording the topography of the ocean floor. The house in the photograph was occupied by Mr A Campbell, who “complained about the generator noise. He had spent his life at sea in engine rooms and thought he deserved a peaceful retirement”. As a consequence, a cable from the caravan was connected to the mains electricity supply. Includes additional emailed information. Draft report about the potential impacts of a large windfarm off the coast of Tiree, 2012. Prepared by Ironside Farrar Consultants on behalf of the Tiree Onshore Scenario Mapping Steering Group. 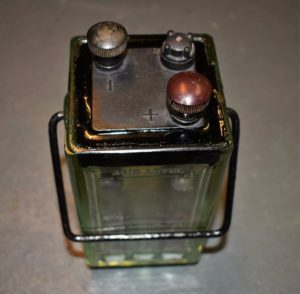 Lead-acid 2V accumulator made by the Chloride Electrical Storage Company around 1940-1950. Two lead plates submerged in sulphuric acid (no longer present) within a glass box with carrying handle. The accumulator would be charged every week and used for powering radio sets (heated the valves). 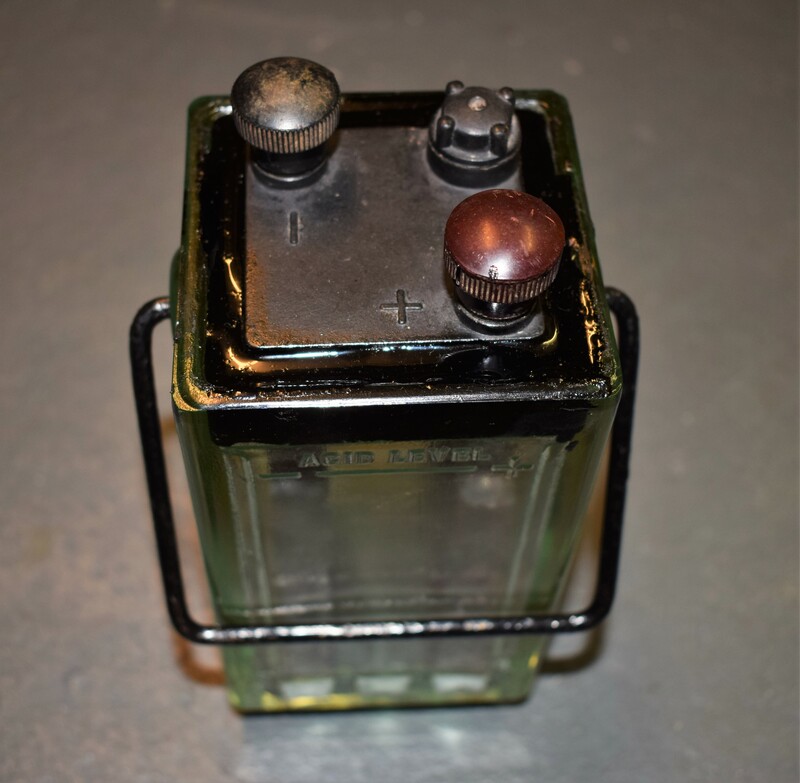 Wooden carrying box for a glass lead-acid accumulator battery. Recreated by John Fletcher, Balemartine, from one belonging to Dugald MacArthur, tailor, Balemartine. Section of the sub-sea power cable that conducts electricity to Tiree from the mainland. The section was cut from between Gunna and Tiree when the power cable was broken and replaced in 2011. Three-phase current at 11,000 volts (compared with the Islay cable which operates at 33,000 volts). Yellow and black outer sheath, inner protection of ring of steel wires, followed by ring of lead insulation around inner electrical cable of three copper cores. Colour information pamphlet about the proposed `Argyll Array` offshore wind farm, that Scottish Power Renewables planned to site off Tiree`s western shore, from 5km offshore to Skerryvore, and announcing public information days in Coll and Tiree in September 2010. 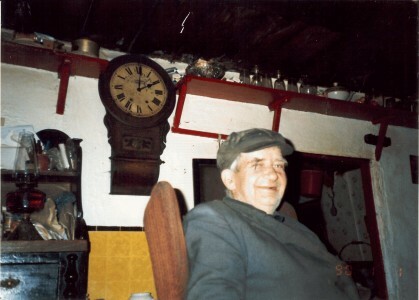 Colour photograph of Calum (Iain Bhan) MacKinnon in his house in Kilmoluaig beside his chiming clock, ca 1980. His house was the last without electricity on the island – he never wanted it. 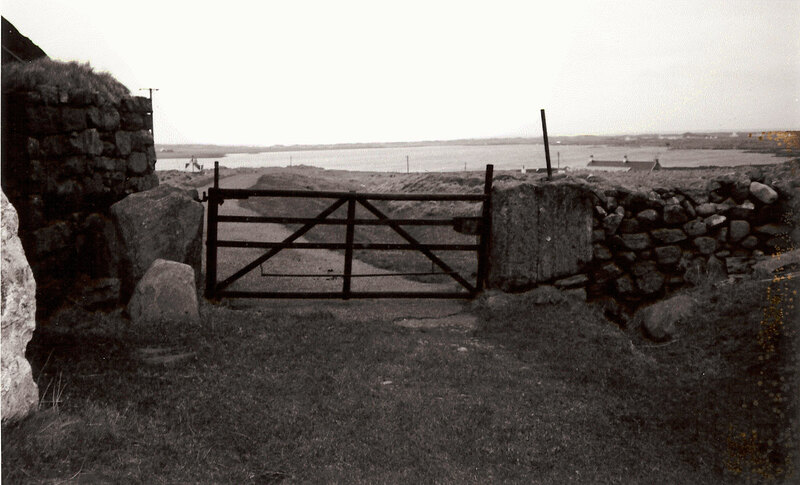 Black and white photograph of the view of Loch Bhasapol from the door of Calum (Iain Bhan) MacKinnon`s house at Kilmoluaig during the 1970s. Note the size of the stones acting as gate posts and bolt for locking. His house was the last without electricity on the island – he never wanted it.